The Digital Product - Digital User (DPDU) project aims at developing an innovative approach in the holistic modelling of human-machine systems with regards to a systems cognitive ergonomics. Cognitive ergonomics specifies how a systems design should be adapted to the users cognitive abilities, skills, and strategies. The proposed approach will extend a cognitive architecture to include spatial cognitive processes and individual differences in spatial abilities to improve human-machine-interaction that involve spatial tasks. Human spatial cognition plays an important role in the interaction of a user with technical systems and thus, the proposed project integrates a new spatial module in an existing cognitive architecture to allow modelling of spatial cognitive processes in more detail. This modelling approach will be based both on behavioural and on electrocortical data. In addition, a holistic system view will include a user model as well as a technical model from the very beginning of the product development cycle. To achieve this, an exemplary human-machine system model for an engineering application will be implemented. 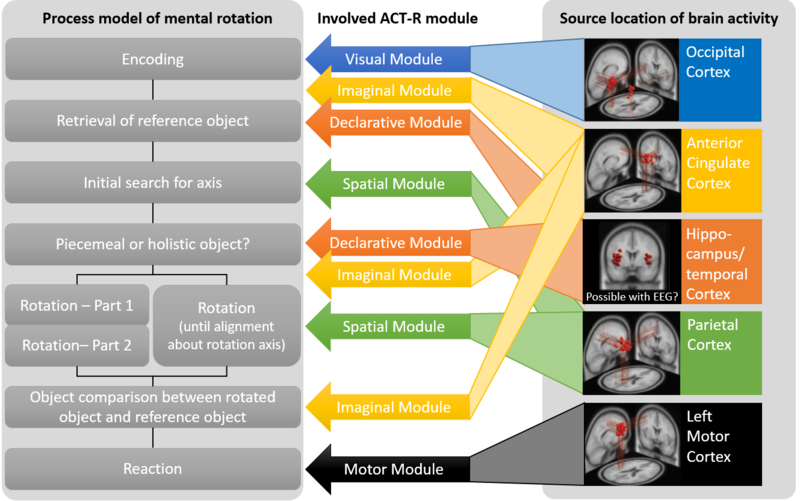 In the first step, a cognitive model for the spatial cognitive processes of mental rotation and mental folding will be developed. In a second step, the cognitive model will be extended to simulate a combination of these basic processes. In addition, an interface will be implemented, enabling the cognitive model to interact with the technical model. Each iteration of the cognitive model will be experimentally evaluated with regard to its behavioural and neurophysiological validity. EEG data will be acquired and analyzed to not only help to evaluate the current model iteration, but to inform the respective next extension. Based on predictions from the cognitive model, the electrophysiological data can be tested to allow for a theory-driven neuroscientific approach to investigate the neural basis of the basic spatial cognitive processes. Finally, advancing from established 2D stimulus material to more complex and naturalistic stimuli to a real operating table, the EEG methods progress from established desktop-based investigations to mobile brain/body imaging (MoBI) approaches that allow recording and analyses of EEG activity in actively behaving participants. The resulting holistic system model will provide a new and innovative method for the evaluation and development of technical systems from the very beginning in the development process. The project provides a new method for informing EEG data by cognitive models and to develop cognitive models by neurophysiological data with high temporal resolution. 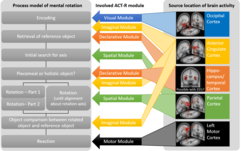 The combination of cognitive modelling and electrophysiology offers a unique possibility to further develop both fields and to provide the basis for a holistic modeling approach. The project is led by Nele Russwinkel with the involvement of Klaus Gramann, Rainer Stark and Carina Fresemann. As research assistants, Kai Preuss (Cognitive Modelling) and Leonie Raddatz (Biopsychology) participate in the project. Further support lies in the involvement of the student assistants Cédric Donati and Severin Reuter.